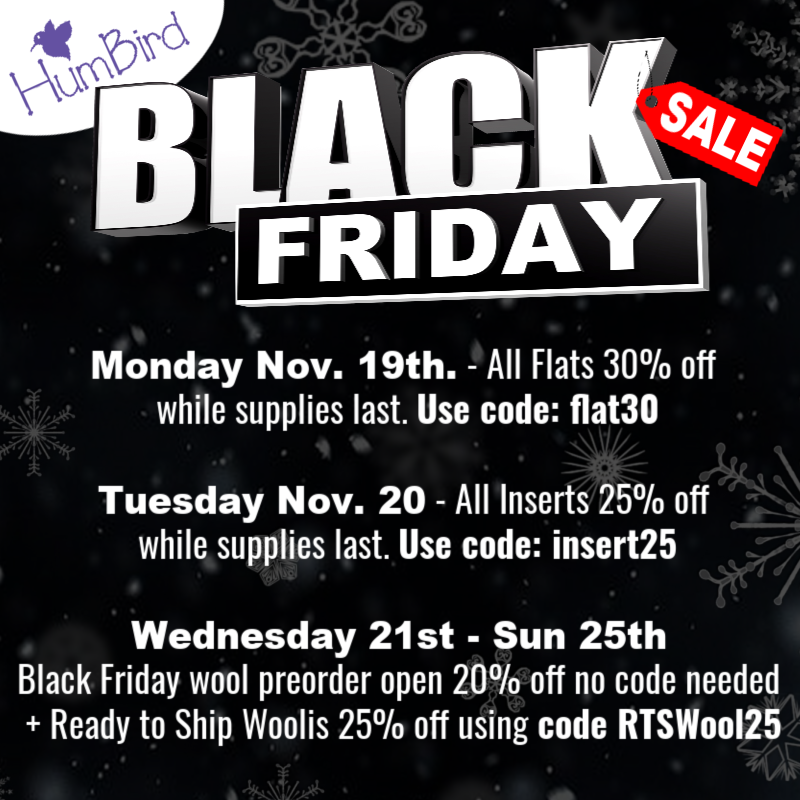 No matter your budget, there’s no denying that Black Friday is the best time of the year to stretch your cloth diapering, baby wearing, and mama gear budget! Whether you’re shopping for Christmas gifts or building your own stash, you’ve come to the right place. 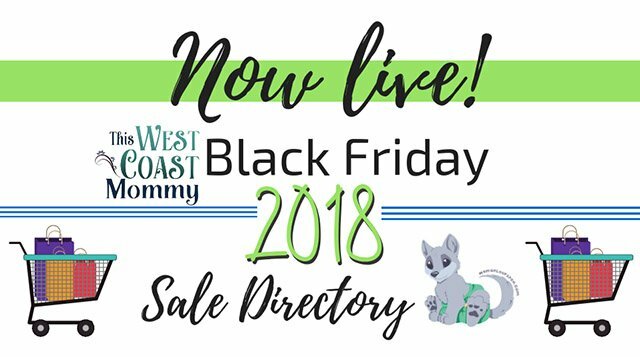 The fabulous retailers in This West Coast Mommy and Maman Loup’s Den’s Black Friday Sale Directory have deep discounts, bonus offers, and giveaways to entice Canadian and American shoppers! 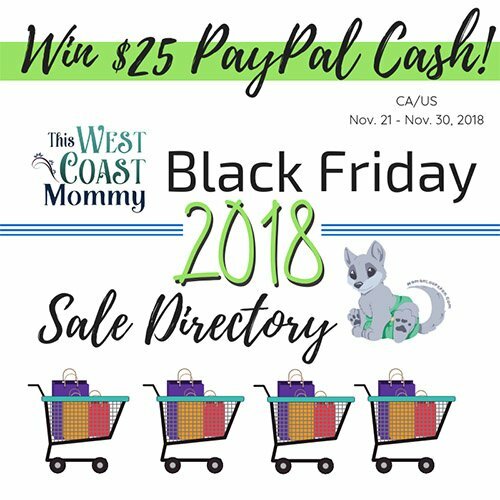 Don’t forget to enter our giveaway at the very bottom of the page to win $25 in PayPal cash towards your Black Friday shopping, and leave us a comment thanking our participating retailers for making their sales so easy to find! *Note that due to time constraints and manufacturer sale policies, some sales may be slightly different than the information we received from our participating retailers. Their websites will reflect their most up-to-date sale info. Sale Dates: Sale prices are all valid from start date until Sunday Nov 25th while supplies last. Shipping: Shipping is based on price of order and divided into wool only orders and orders containing flats and or inserts. Save 15-75%* when you shop with us, plus earn gifts with purchase! • Use coupon code BLACKCLEARANCE in our Sale & Clearance section to save an additional 25% off the lowest listed price for savings up to 75% off. • Use the coupon code: BLACKFRIDAY5 to save an extra 5% on AppleCheeks and GroVia! • Save 20% on Denny and Loic UPPAbaby products (select from drop down box), no coupon code required! 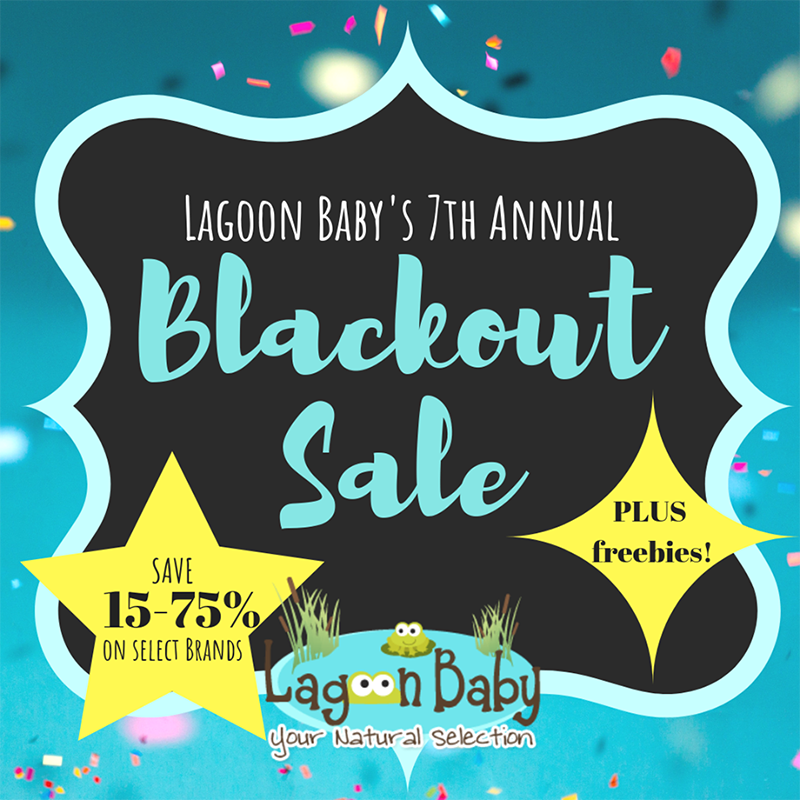 • Purchase $100-$249, get a FREE TotsBots EasyFit Star Diaper OR a Lagoon Baby exclusive Sweet Pea Frogs & Fish Tails wet bag (RV 13.45-29.95)! • Purchase $250 or more, get a FREE Ju-Ju-Be Be Light (RV $54.95)! Please note: Gifts are based on your total after discounts have been applied and before taxes and shipping. We will include a randomly chosen print for your Gift with Purchase, due to the volume of this sale we are unable to grant requests. One gift per order (except Sea to Sky, if applicable). We’ve got awesome savings for you when you shop in-store, too! Save 15% off the entire store*, as well as fun gifts with purchase when you come to our storefront location in Maple Ridge, BC from November 23-25th. See website for details. * Items purchased using the coupon codes or on sale are FINAL SALE. Some restrictions apply. Shipping: Free shipping over $99 within Canada. Lettermail shipping available in Canada. We ship internationally, see website for details. Rewards program! Sale prices cannot be applied to past or future orders. Items marked clearance are final sale, no returns/exchange/warranty. Sale Dates: November 23 12:01am EST to November 26 at 11:59pm EST. • CANADA: Complimentary Expedited Shipping starts on order $100+ (includes tracking and insurance). Flat Rate Expedited Shipping starts at $10 (includes tracking and insurance). Letter Mail $5 (for small-thin items only, no tracking, no insurance). • US: Complimentary Expedited Shipping on order $200+ (includes tracking and insurance). Flat Rate Expedited Shipping $20 (includes tracking and insurance). Letter Mail/Small Packet $10 (for small, light, thin items only. No tracking, no insurance). 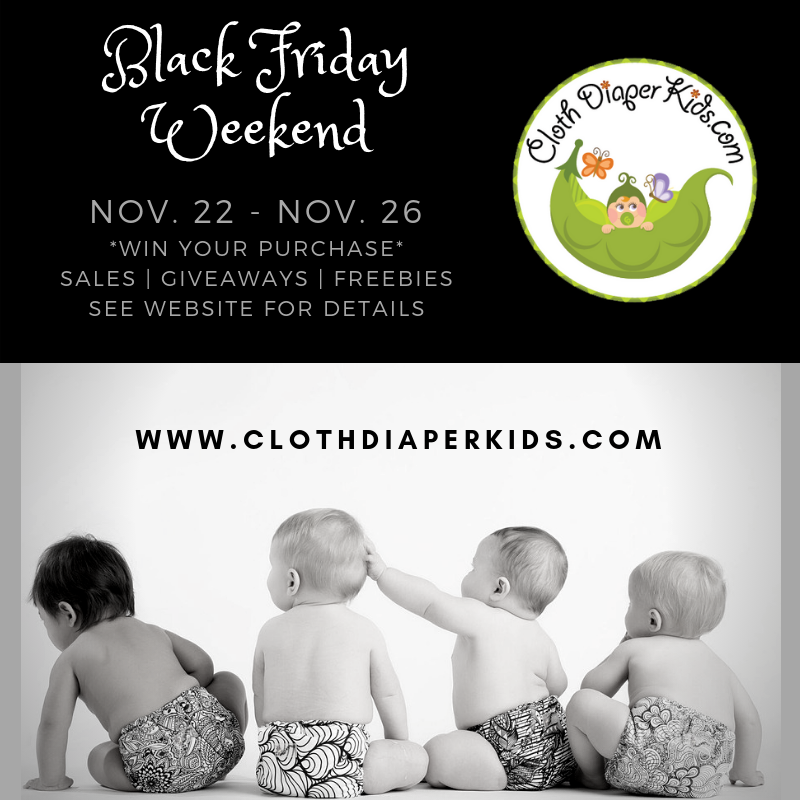 • 30% Off Firespiral & Butterfly Baby Co.
**WIN YOUR PURCHASE** Shop with Cloth Diaper Kids this Black Friday Sale season and be entered into the draw to win back the entire value of your purchase! The winner will receive a gift card to Cloth Diaper Kids to come shop with us again on the house for the full value of your Black Friday purchase (less any shipping fees you paid). 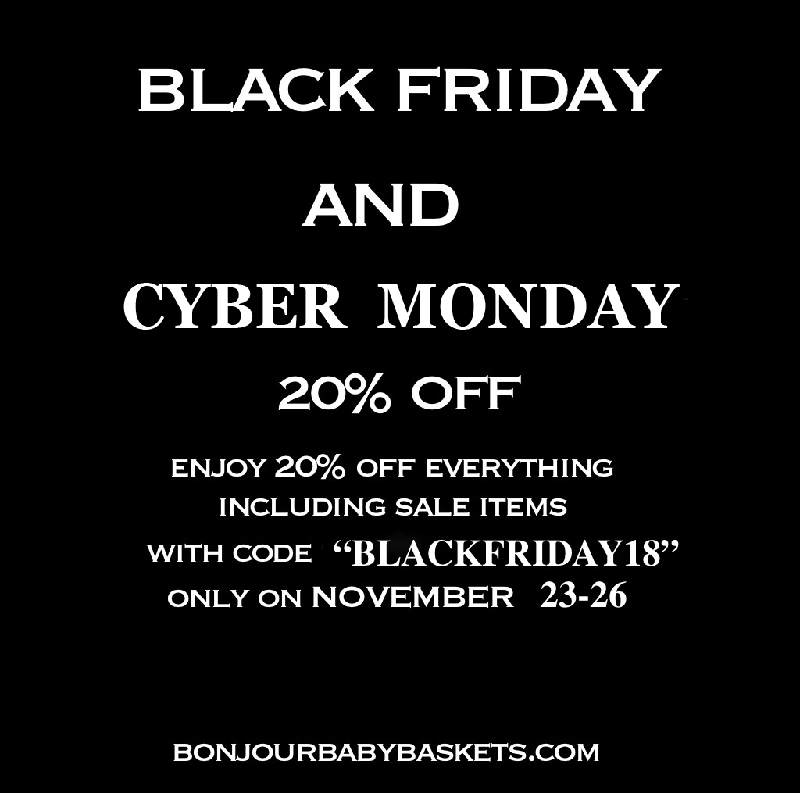 Applies to any orders placed between 12:01AM MST on Thursday, November 22 – 11:59PM MST on Monday, November 26, 2018. Full details on all our sales, giveaways, and stackable freebies will be on our website. • 10% off all Blueberry diapers and accessories including waterproof mattress pads. • 20% off all diapers, inserts, learning pants, storage sacs & accessories. • 15% off our store exclusive Purple Rain (excluding size 2 storage sacs). • FREE PURPLE RAIN MINIZIP for all orders containing $99+ worth of AppleCheeks products during the sale period. No code necessary. • NOTE: AppleCheeks sale STARTS Thurs, Nov. 22 at 9AM, but Size 2 Purple Rain Sacs will stock live for ordering at 10PM MST. All sales of ANY Purple Rain color item get a free tree planted in your honor in the Kids Saving the Rainforest Sanctuary in Costa Rica! • NOTE: Thirsties sale STARTS at 9AM MST Thurs, Nov. 22 but PANDAMONIUM stocks at 10PM MST on the 22nd. All sales END Mon, Nov. 26 at midnight as usual. Sale Dates: Dates vary. Most brand sales run from Thurs, Nov. 22 (10PM MST) to Cyber Monday, Nov. 26 (Midnight MST). See above for details. Shipping: FREE shipping on orders over $79 to Canada. FREE shipping or orders over $99 to USA. Bonjour Baby Baskets offers a gorgeous selection of trendy and safe baby gifts for all the gorgeous newborns of the world. Shipping: Free shipping on orders over $50 within Toronto and GTA. Free shipping on orders over $80 Canada-wide. Free shipping on orders over $100 to USA. • Buy One Get One 50% Off! The award-winning PumpEase hands-free pumping bra is Buy One Get One 50% Off now through November 30, 2018 on snugabell.com using coupon code BF2018. PumpEase holds your breast pump flanges securely in place so you can read, text, eat, email, care for your child, or just relax while you pump your breastmilk…hands-free! You don’t need to fuss with awkward straps or adjustments; PumpEase is easy to use and looks great for moms who aren’t willing to forgo fashion for function. 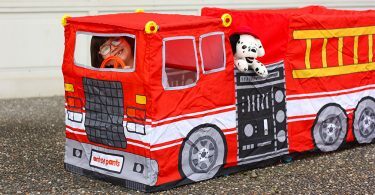 PumpEase will also have an online coupon available in Snugabell’s Amazon.com and Amazon.ca shops Black Friday through Cyber Monday. Sale Dates: November 21 noon EST through November 30th. Shipping:Orders of $75+ on snugabell.com ship free within Canada and the USA. • Sale applies to in stock items only. • Custom orders will be 15% off on Monday, November 26 only. No coupon code needed! Sale Dates: Sale starts Friday, November 23 and runs until midnight Sunday, November 25. Shipping: Flat rate Canadian shipping $16. Flat rate within Newfoundland $12. Lettermail for $4 if your purchase fits. • Freebies – every order over $50 will receive a freebie of our choosing! • AppleCheeks Be Brave – For each item purchased, you will be able to get 10% off of each Be Brave item you purchase as well! For example, if you buy 3 products, you can also get any 3 Be Brave items for 10% off. If you buy 5 products, you can get any 5 Be Brave items at 10% off. The discount will come off automatically in your cart! Sale Conditions: Sale prices are applicable to in stock items only, and cannot be applied to any previously purchased items. Reward points can be earned but not redeemed during the sale. • Canada – Expedited Shipping via Canada Post with tracking and $100 insurance. ON, QC, MB, & SK – $5, free on orders of $150+. BC, AB, NB, NS, PEI, & NL – $6, free on orders of $150+. NU, NT, & YT – $15, free on orders of $200+. Lettermail is available on small orders for $3. • USA – $5 for orders under $150, free on orders of $150+ (will ship from a USA Post Office November 29th). • Double Rewards points, Freebies, Coupons and Giveaways! • AMP, Applecheeks, Best Bottoms, bumGenius, Blueberry Diapers, Bummis, Boba, Beco, Cj’s Butter, Colibri, Cuddlywrap, Dimpleskins, Earth Mama Angel Baby, Flip, Funky Fluff, Logan and Lenora, Planet wise, Rockin Green, Rumparooz, Sloomb / sustainablebabyish, Snappi, Soak and Thirsties! • Save 15% or more on the rest of the store! • Visit our site for hard to find prints and clearance items! Sale Dates: Friday to Monday PST. Shipping: Free Local Pickup, Free Shipping after $99 and Local Delivery options! Save up to 50% off your favourite brands and don’t miss our GIVEAWAY for a Standard KinderPack in Daydream with Koolnit! Shipping: Free shipping for orders above $129 or $9.99 flat rate shipping within Canada. $14.99 flat rate shipping to the US. Shipping: Free shipping no minimum in USA and Canada. Save 10-75% Site Wide! 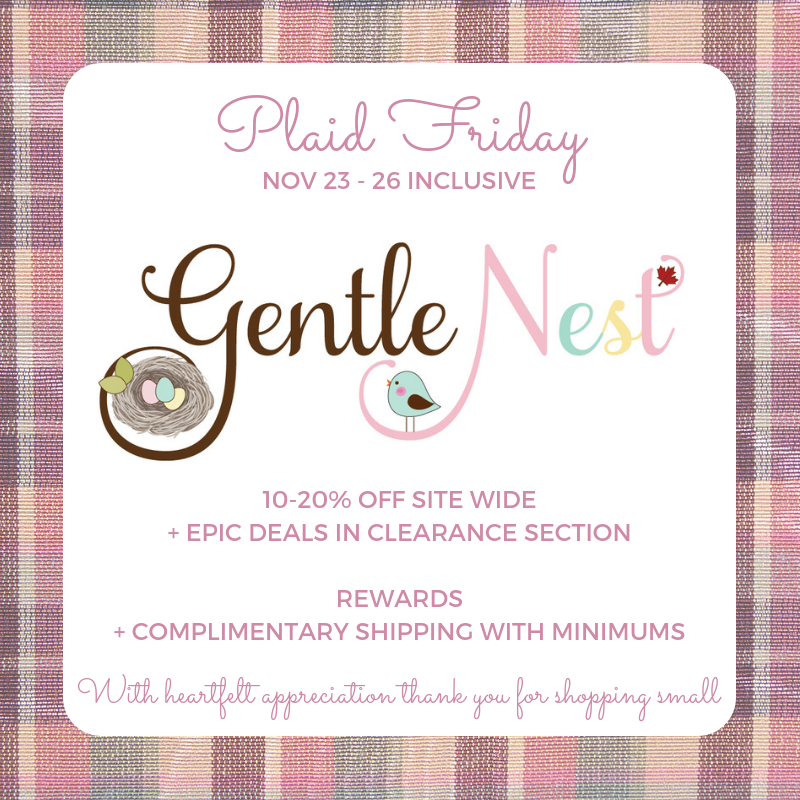 Free Gifts with purchases! See home page of our site for more details. • 20% OFF GroVia, AppleCheeks, Thirsties, SprayPal and MORE. • 15% OFF Smart Bottoms, AMP, MotherEase, Super Undies, Stonz, Peapod Mats,Toys, Mama gear such as Diva Cup, Oko Creations, Garden By the Sea, Routine and MORE. • 15-20% OFF Reusable kitchen and lunch gear such as reusable straws, Colibri, Abeego, Re-Zip bags, lunch boxes and MORE! • 25% off S’ip & S’well! • Starting at 40% off JuJube! • 50%-70% off all designer diaper bags: JuJuBe, Lassig Petunia Pickle Bottoms, Skip Hop, OiOi, Storksak, Babymel, Babymoov, Diaper Dude, and more. • Up to 40% off all major cloth diaper brands: bumGenius, GroVia, AppleCheeks, Kangacare, Blueberry, Smart Bottoms, Bummis, AMP, and more. • Mystery discount on lots of baby carriers: Tula, Lillebaby, Ergobaby, Moby Wraps, Beco, Boba, and more. Visit us for details! 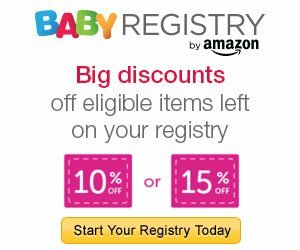 • Up to 40% off on mom and baby gear: Robeez Baby Shoez, Tokidoki themed items, Skip Hop toys, Aden and Anais blankets, and more. Sale Dates: November 20-26. Check back as more items are added! Shipping: Free shipping in Canada on orders over $99. Free shipping in the US on orders over $179. Momzelle is a family business based in Montreal. They work hard to design the most practical, stylish and comfortable nursing clothes and bras with a focus on amazing customer service. A wide selection of breastfeeding apparel and maternity essentials means convenient, one-stop shopping for new and expecting moms. Sale Dates: November 21 12:01am EST to November 27 at 11:59pm EST. • CANADA: Free Expedited Shipping starts on order $100+ (includes tracking and insurance). Flat Rate Expedited Shipping starts at $9.95 (includes tracking and insurance). Letter Mail starts at $2.95 (for small-thin items only, no tracking, no insurance). • US: Free Expedited Shipping on order $200+ (includes tracking and insurance). Flat Rate Expedited Shipping $14.95 (includes tracking and insurance). Letter Mail/Small Packet $5.95 (for small, light, thin items only. No tracking, no insurance). BOGO Deal: Buy One, Get One 50% off. Applies to select marked down clearance/retired styles, diapers, inserts and wetbags. 50% discount is applied to lowest marked price for huge savings! Most items already marked down 20-50% off. Mix/match and multiples are honoured. Terms & conditions apply. Shipping: $10 CAD flat rate shipping, FREE shipping on all US and Canadian orders over $99 CAD. International shipping available. • Monday, Nov 26th: 15% OFF EVERYTHING!!! Our 3 in 1 Maternity Coats and Jackets are babywearing friendly and can be worn with your favorite baby carrier. Baby in: wear your coat with the extender panel when pregnant. Baby out: reverse the panel and wear as babywearing coat. Baby free: Remove the panel and wear as regular winter coat. Shipping: We offer flat rate shipping of $5 CAD in Canada and $5 USD in the US. Are you exhausted by your child’s current sleep habits or struggles? These can include sleep regressions, frequent night wakings, bedtime battles or early mornings. Not to worry! I love helping families overcome those sleep challenges. My name is Alison, and I’m a Certified Paediatric Sleep Consultant and owner of Cheeky Sleeper. I love to educate, coach and help parents find confidence in making healthy sleep decisions for the entire family. Cheeky Sleepers offers one and two-week sleep packages including a one-hour (video) sleep consult, personalised sleep plan, daily support and detailed wrap-up sleep package. If this is of interest to you, please get in touch by email at alison@cheekysleeper.com. Use code CheekyBlackFridaySales2018 for 10% off either package. You can also find Cheeky Sleeper on Facebook and Instagram where I share lots of valuable free information. Sale Dates: Code good until December 31, 2018. One lucky shopper will win $25 CAD to put towards their Black Friday shopping! Enter in the giveaway widget below. This giveaway is open to residents of Canada and the US, 18+. All entries will be verified. Disclosure: This post contains paid advertisements. Please contact olivia@thiswestcoastmommy.com with any questions about advertising or to sponsor your own event. I visited Looper’s Luffs to check out the cloth menstrual pads. Snugabell has what I want! I am eyeing to buy a pumpease pumping bra because with twins I would like my hands free while pumping to do other things. I adore the You Are My Sunshine blanket at Bear Bums. I visited Little Wonder Star. I’m interested in Betty, the bamboo nursing top with built in bra. I visited Lagoon Baby. I like the Pearhead Ugly Sweater Christmas Bibs – Set of 3. So cute! I love the Baby Hat with stars at LITTLE WONDER STAR. They have the most adorable products! I visited Omaiki and liked the Family Size Sack – Macarons. I visited The Baby Footprint and liked the Peapod Mats. I visited Lagoon baby as I am looking for stainless steel straws. https://nuggles.ca/ , BambooLUXE Terry Prefold Insert – Nighttime look cool. The XS Cuffed Straighties (shorts) Mauvelous-Once in a Blue Moon at HumBird are beautiful and so comfortable looking. I visited Looper Luffs. I am interested in their ponchos. I visited Bonjour Baby Baskets and liked the Ring around the Rosy Gift Basket. You Are My Sunshine blanket at Bear Bums. The Cutie Patootie – Carseat Covers are adorable!!! I love them all! I visited the Gentle Nest. I’m interested in the Matter Butterfly Weed repellent and their sun care products. I visited Carry Me Mommy and liked the Tula Carriers. I popped over to Lagoon Baby and love the selection of carriers – like the Tulas! I visited lilmonkey cheeks and would love some more tumble tarts dryer balls! I love the O’Canada Soapworks – Specialty Soap Bars on Cloth Diaper Kids’ site! I visited Humbird. I would like to try the Supernova overnight diaper. I visited Nuggles Designs Canada and liked the Blush Collection Womens Eco Leggings. I visited Bonjour Baby Baskets. I am very interested in the ALPACA KNITTED APPLE MITTENS. I visited Lil’ Monkey Cheeks and like the Tula Free-to-Grow Baby Carrier. I like the Robeez Soft Soles – Pretty Pansy Pink from Enfant Style! So cute! A merino neck warmer from little wonder star would be great for playing outside! I visited Lil Monkey Cheeks and liked the Delish Naturals Simply Soap. I visited Omaïki and am interested in the nighttime trainers for my grandson. I love BONJOUR BABY BASKETS – their SWEETEST BUNNY BABY BASKET is adorable. Everything is just soo nice! I visited Baby Footprint. I would love to get re-zips! I visited Bear Bums and liked the Swedish Tea Towels – Jangneus Collection. I visited Bear Bums. They have very good prices on Bummis sunhats and Applecheeks UV tees. Those are two things on my list for the grandchildren. I visited Lil’ Monkey Cheeks and am interested in the CJ’s BUTTer Shea Butter Balm Mini. I love the Beco Gemini from Bear Bums! It looks very sturdy and comfortable and safe!